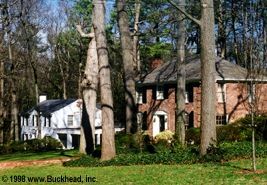 The Collier Hills-Ardmore Park area of Buckhead is rich in Atlanta history as well as lush landscape. Some of the bitterest fighting of the Civil War's Battle of Atlanta took place in its gently rolling hills and hollows and along boulder-strewn Tanyard Creek. The earliest history of the area is commemorated on a granite marker at the intersection of Peachtree Road and Palisades Road (just north of Collier Hills on the opposite side of Peachtree). This monument marks the spot where two major Creek Indian trails intersected, the Echota Trail and the Peachtree Trail. 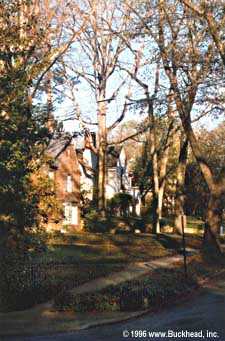 Later, the area was the estate of Andrew Jackson Collier, whose name survives in the names of Collier Road and Anjaco Road (ANdrew JAckson COllier). 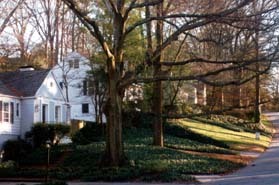 The homestead of the Collier family, one of Atlanta's oldest, once stood near the southwest corner of Peachtree Road and Collier Road. Mr. Collier's grist mill (Collier's Mill) on Tanyard Creek, near where the creek runs under Collier Road, was an early landmark and later the scene of bloody Civil War fighting as Confederate forces desperately attacked the armies commanded by Maj. Gen. William T. Sherman that were closing in on Atlanta in July 1864. Bronze markers in Tanyard Creek Park and old mill stones and markers at the corner of Redland Drive and Collier Road recall this history. 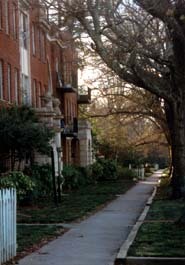 Near Peachtree, along 26th Street, 28th Street and Collier Road in the Ardmore Park neighborhood, mellow brick apartment houses and duplexes mix with older home shaded by huge oaks and beeches. The Ardmore-Anjaco area's winding streets are lined with brick/frame cottages, grander two-stories and a sprinkling of newer in-fill homes on modest-size, heavily wooded lots. The actual Collier Hills neighborhood rises from Tanyard Creek and the railroad line to Northside Drive. Most of the homes here were built by developer Herbert W. Nicholes shortly after World War II. Almost all show signs of recent renovation and expansion. The area enjoys three parks: Tanyard Creek at Collier Road and Walthall Drive, Ardmore on Ardmore Road off Collier Road, and Atlanta Memorial (which includes the Bobby Jones Golf Course and Bitsy Grant Tennis Center) off Golfview Drive. The area has easy access via Peachtree to both Midtown and Buckhead. 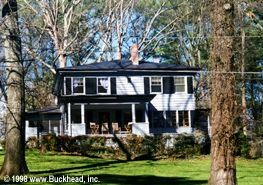 It is conveniently close to shopping and restaurants along Peachtree Road, medical facilities around Piedmont Hospital and AMTRAK rail service at Brookwood Station. Schools (see Buckhead education) include Morris Brandon Elementary, E. Rivers Elementary, Sutton Middle School and Northside High School.